When you first purchase an acoustic guitar, before you learn anything about chords and scales, strumming and picking, you must learn about stringing and tuning the guitar. It's an elementary lesson of EADGBE, low to high, thickest string closest to you and the thinnest farthest away. Bridge pins come out, the strings go into the bridge as such, pins back in, and the strings ride up the fretboard, through the nut, into the tuning pegs of the headstock ready for turning. The tuners wind the strings around until they reach their correct notes, and with a bit of tweaking, things should be in place. The initial tuning always takes a while for the strings to keep in tune, but after some wearing in, they settle down and stretch into place. You really need to stay motivated and inspired. Read every magazine and helpful blogs like Guitar Adventures as these will keep you excited about new riffs, gear and ways to improve. Sure it's important to understand how the guitar is strung and tuned. There are some great resources out there like this one from Take Lessons which covers some easy tricks as well as pro tips. We all understand the standard tuning, and all the chords that are tucked inside, but when you start playing around with the tuning, your acoustic guitar takes on a new face. Often the first variation in tuning that guitar players bump into is dropped D. This adds a heavier rhythmic sound to the chords, and enables faster play and a deeper bass note for picking. If you really want to change things up, then you can introduce open tunings, such as open D (DADF#AD). Once you introduce these into the mix, you might as well be playing a brand new instrument. Now you can learn all those chords over again, different positioning and different scales on the fretboard, all brining in entirely different sounds. Maybe even slip a piece of glass or metal on your finger and you can take off into a whole new world of music. The boring subject of tuning has now transformed the way you can play and the sounds of what you play- and there are loads of new variations on top of this. If you want to get crazy you could entirely change the way the acoustic guitar is strung, take one string away, change the low E to a high G, move the rest into DGBD tuning and you literally have a brand new instrument- the banjo. 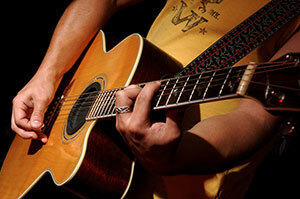 Just because the guitar arrived in standard tuning, doesnâ€™t mean that it has to stay that way! This is all part of the beauty of playing the acoustic guitar. Itâ€™s an extremely versatile instrument capable of playing one type of music in one second, and a completely different type of music in another. Just when you think you have the guitar mastered, change up the tuning, and you are right back where you started.